Jan started at St. John’s in Kindergarten, raised her children here and, while a “professional volunteer” in the community, also volunteered at St. John’s in the few roles open to women at the time. 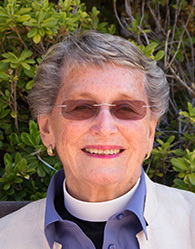 When the children were grown, Jan went to seminary, graduated from CDSP, and for ten years served as Executive Director/Pastor of the San Rafael Canal Ministry. After a two year stint as Associate Rector, she rejoined the voluntary support clergy in “Team B,” and now co-facilitates the Advent Quiet Day and presides over the 2nd Thursday noon Eucharist. Jan enjoys walking, swimming and reading historical novels, and has retired twice……….to no avail! !